Welcome to another incredible Lego world! The Lego Make & Create Cafe Corner features all the activity, colors, and architecture of a real town building. Realistic decorations include cafe tables with umbrellas, striped awning, hotel sign, trash can, street light, bench, and more. Recommended for ages 16 years and up, this Lego model is more than just child's play. Like a good puzzle, it's fun to assemble the 2,056 pieces of this model. Built in sections, it can even be taken apart in three sections for easy storage and transport. The top two stories lift off to reveal inner rooms, staircases, and handrails. 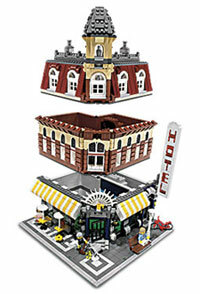 Perfect for Lego-maniacs and collectors with other sets, the modular design of this town corner allows urban planners to expand the street with a neighborhood or a hotel. Or, with connectors at the base of the structure, four Cafe Corners can be joined together. Create a real town building complete with umbrellas, street lights, and awnings. The top two stories lift off to reveal inner rooms, staircases, and more. 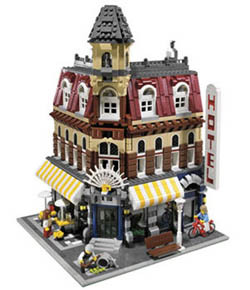 Developed in co-operation between consumer requests, fans, and Lego designers, this detailed and realistic street corner scene features special and rare Lego colors and pieces, and also incorporates new building techniques, including an opening front door and door top decoration. The kit includes three mini-figure townspeople -- two males and one female -- as well as neighborhood-themed elements such as a dustbin and a bike. The interior and exterior are different from each other, and special Lego colors in this set include dark blue, dark red, medium blue, and transparent red. Built completely on mini-figure scale, the street base is a 10 by 10 inch square and the building stands more than 14 inches high. Durable plastic Lego construction makes this micro-scale town building sturdy and reliable. The world-famous building block set encourages a unique type of play that is fun, creative, engaging, and challenging. Taking its name from an abbreviation of two Danish words, "leg godt," meaning "play well," LEGO has been inspiring children and adults to do just that since 1932. Seventy-five years later, LEGO is one of the world's largest toy manufacturers, with products sold in 130 countries.